I've learnt this recipe from my grandmother who loves to spend almost her life in the kitchen ;-). 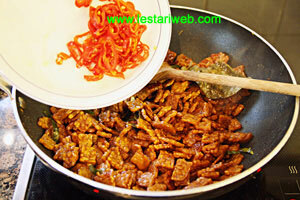 Compare to common recipes of Spiced Fried Tempeh, here is little bit different. 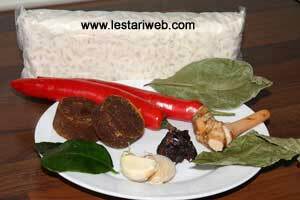 My grandmother always put sliced kaffir-lime leaves on it, as she said to obtain the best taste and aroma. And I assure you she is right!! ;-). 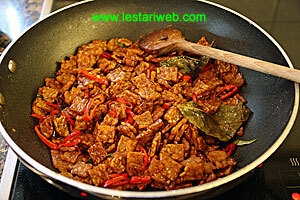 Tips : Please use the fresh and good quality Tempeh to get the best result. 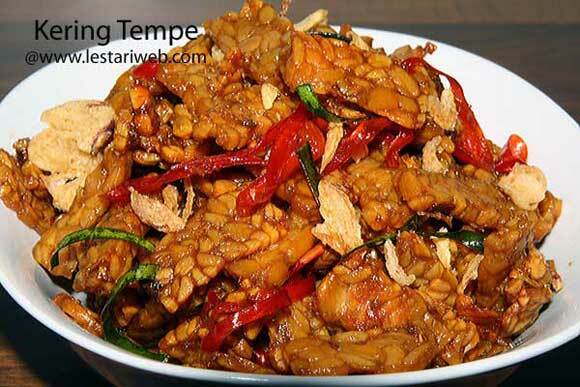 For you who don't like spicy dishes, dont't worry. This dish is not a spicy at all because we use only the de-seeded red large chillies not the small spicy one. Heat 50 oil in a fryingpan, deep-fry the tempe until gold brown. Set aside to drain. 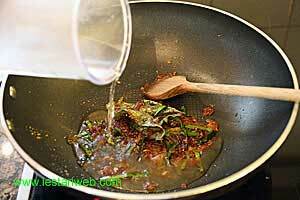 Fry the sliced chillies in the used oil. Put aside. 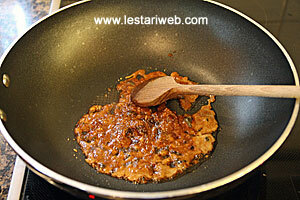 Put all ingredients for the paste in blender or mortar and blend/grind until smooth. 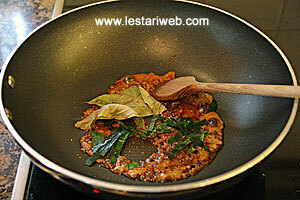 Heat 2 tbsp of remaining oil in a fryingpan, stir-fry the paste until fragrant. 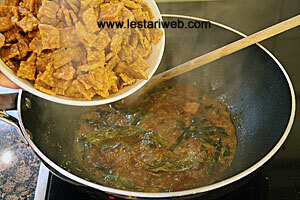 Add the salam leaves & sliced kaffir-lime leaves. Pour in the water, stir to mix. Bring to boil and continue cooking until the mixture becomes thick. Adjust the heat into low. 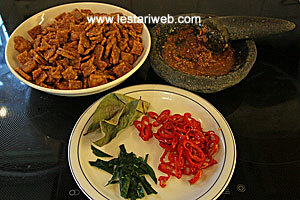 Add in the fried tempe & chilli. Stir to mix. Remove from heat. Garnish with fried shallot/onion. Serve hot or cold.